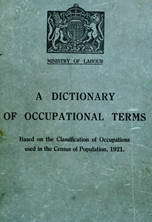 A Dictionary of Occupational Terms Based on the Classification of Occupations used in the Census of Population, 1921.
represents and takes orders for firm or firms in particular town or district, working on own account on commission basis, or as employee of one firm on salary and commission; sometimes specifically designated, e g. African agent, carpet agent, commercial agent, manufacturer's agent; displays samples in own show rooms or from travelling bag; cf. commission agent (890). makes enquiries and gives advice to firms as to stability or otherwise of firms or persons with whom they contemplate doing business. arranges passages, etc., for intending emigrants; advises as to choice of country, giving all necessary information available; usually done by passenger agent or shipping agent (730) (q.v.). keeps registers of vacancies notified by employers, and of applicants for employment; provides suitable introductions; takes fees for services rendered. circulates authors' manuscripts among publishers or editors; undertakes business on acceptance of manuscripts, e.g. copyrights, fees, American production; sometimes criticises literary work for a fee. an agent (q.v.) acting for manufacturers of Manchester goods, e.g. cotton goods made in Manchester and district. arranges mining royalties on behalf of mine owner (040) (q.v. ), draws up terms of mine leases and completes settlement with lessees, ensures on owner's behalf that terms are carried out; undertakes collection of royalty rent or "fine" when same not paid into mine owner's account direct; is almost invariably a qualified mining engineer, cf. mine engineer (040). assists aliens to take out naturalisation papers; prepares declaration forms, prepares and inserts necessary advertisements in newspapers, undertakes correspondence with Government offices, referees, etc., leading up to granting of naturalisation certificate. an employment agent (q.v.) specialising in the supply of nurses for private patients, nulling homes, hospitals, etc. arranges passages by steamship, railway, motor coach, etc., for intending travellers; issues tickets; undertakes forwarding of luggage; obtains transport; changes money; cf. agent, emigration. undertakes all kinds of business in connection with protection of inventions, trade marks and designs; draws up specifications and assists with registration, exploitation, sale, etc. advises parents as to choice of school, arranges placing of children at school chosen; also acts as employment agent (q.v.) for schools and teachers. acts as intermediary between buyer and seller, charging commission (brokerage) on money value of transaction; does not handle goods and has no lien on the subject matter of transaction; usually specifically designated, e.g. cotton broker, patent broker, West India broker; cf. stock broker (792), insurance broker (794), ship broker (730), bill broker (799), etc. as for agent except that he does not act as employee of any firm; differs from broker (q.v. ), in that he may hold and control possession of goods; cf. factor (770). an employment agent (q.v.) specialising in domestic service. Ministry of Labour, 1927. Digitised by Peter Christian, August, 2016. This text is in the Public Domain.